Thank you for choosing to do the right thing by recycling your electronics and appliances at the Penn Contractors E-Waste Drop-off Site. We are proud to be offering this service in parternship with Responsible Recycling Services of the Lehigh Valley. What Can I Recycle at the Penn Contractors Drop-off Site? Anything with a plug, cable or cord. If you plug it in, we recycle it. 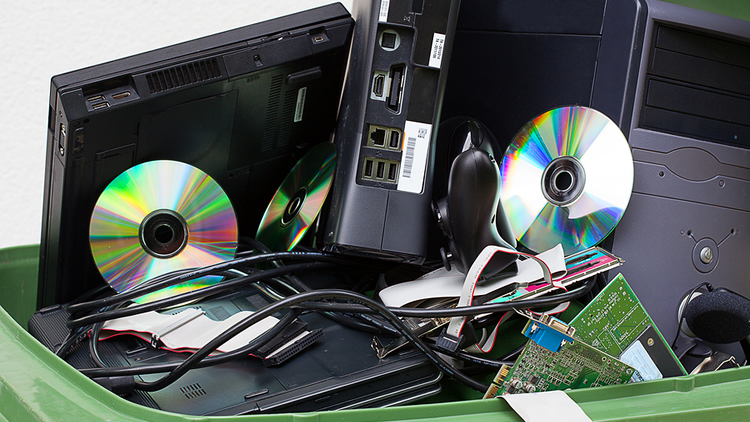 We accept all types of E-Waste including cell phones, batteries, printers, computers, hard drives, copiers, fax machines, projectors, LCD and CRT monitors, TVs, calculators, gaming systems, VCRs and DVD players, and stereo equipment. Ready to Schedule Your Drop-Off Appointment? Please call 610.965.4204 and we'll set-up a time to receive your items. We also accept all types of appliances including Microwaves, Refrigerators, Washers, Dryers, Dishwashers, Freezers, Ovens, Air Conditioners and Dehumidifies. Yes. The items listed below require a fee. Fees must be paid at time of drop-off. We accept cash or checks. Receipts available upon request. For more information or to schedule please call 610.965.4204. Large Appliances: dishwashers, ranges, dryers, washers, refrigerators, chest freezers, large AC units. All TVs—including LCD, Plasma, DLP and LED. All Computer Monitors—including LCD Displays. Any Freon-Containing Appliances like AC units, dehumidifies, refrigerators or mini-fridges. Which Items Can I Recycle for Free? Metal Items: exercise equipment, metal framing, filing cabinets, cabling, metal bed frames, pipes, rain spouting, door knobs and hinges. Small Kitchen and Bath Appliances: toasters, toaster ovens, blenders, mixers, hair dryers. Computer Equipment: towers and hard drives, keyboards, mice, gaming systems, UPS devices, cables and cords. Office Equipment: telephones, copiers, scanners, fax machines, plotters, projectors, A/V equipment, calculators and adding machines, toner and ink cartridges, metal filing cabinets. Cell Phones and cell batteries. CDs, DVDs, and VHS tapes. To schedule please call: 610.965.4204. Please call ahead to schedule a drop-off appointment. Items may only be dropped off if you have called to schedule a drop-off time. Please do not leave items at our facility without permission.